Solana Beach, pop. 14,000, is on the coast 15 miles north of San Diego. The City signed a contract with RedFlex on Dec. 30, 2003, and began issuing warning tickets in Oct. 2004. Some of Solana Beach's tickets can be ignored. 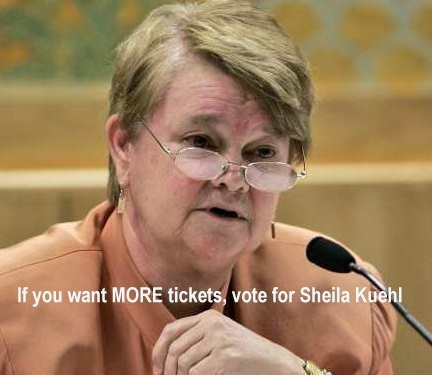 If your "ticket" does not have the Superior Court's name and address on it, it is what I call a "Snitch Ticket." For more details, see the Snitch Ticket section on the Your Ticket page, and Set # 1, below. (B) the month-to-month overlap in the serial numbers (in 2005). See the table's footnotes for further details. Annual or six month total, or annual or six month projection, is by highwayrobbery.net. The 2016 and 2017 projections are based upon the data shown in the table above. 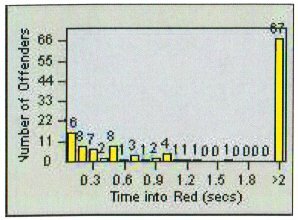 Figures in red type (or, if you are looking at this table in black and white, the upper figure when there are two or more figures in a cell) are what RedFlex calls Total Violations, or all incidents recorded by the cameras, and due to time limitations may have been posted only for selected months or locations. If there is sufficient public interest, the remaining months will be posted. The figures in black type are what RedFlex calls Notices Printed, and represent the sum of genuine citations issued (those filed with the court) plus Nominations mailed (not filed with the court, a.k.a. Snitch Tickets). Data for these months has not been requested. The reports for these months omitted figures for camera 101L. We have asked for new reports. The report for this month was generated less than ten days after the end of the month, so may not reflect the full number of tickets issued. Until 2009 the City paid $89 for each cite issued, up to 179 cites per camera per month, and $80 each for additional cites. On Nov. 12, 2005 the city clerk's office supplied copies of RedFlex monthly invoices containing camera-by-camera totals of Citations Issued (filed with the court). Those 2004 & 2005 figures were entered into the table, above, as Total Citations Issued per Invoices and are in blue type (or, if you are looking at this table in black and white, in italic type). Since the 2009 contract amendment the City has paid a flat rate per month regardless of how many tickets are issued. An official report showed that in 2014, 56% of the City's tickets were for right turns. Except where a balance remains unpaid due to a deficit in the gross cash received as described herein, the City agrees to pay the provider within thirty (30) days after the invoice is received. The 2009 amendment, for a five-year extension ending in Oct. 2014 (plus three optional one-year extensions), allows the City to terminate the program with 30 days notice. Per City documents received in June 2013, the City was paying $2364 per camera, per month. In early 2015 we heard that staff was negotiating a new contract with RedFlex and the parties were very close to agreement, so we wrote to them about the following concerns. that the City has had its RedFlex cameras for a long time, since 2004. Here is how RedFlex has agreed to reward another City's loyalty. California and RedFlex, for that City's system of five cameras. $100 of revenue from each ticket issued). Instead of negotiating a new contract in 2015, the City took the second and third of the optional one-year extensions, resulting in a new expiration date of Oct. 2017. The staff report recommended an up-to-eight year extension of the program, at the same price ($2386) as before and the council approved it 5 - 0 with no discussion except that Councilmember Zito (seconded by another councilmember) asked that, at a later date, there be an item to consider the efficacy of the cameras. The contract contains an escape clause (section 7.2 of the 2009 contract) so the City will continue to have the ability to shut off the cameras on 30 days notice, with no penalty. Over the potential eight years ending in 2025 (a five-year initial term and three optional one-year extensions) the City will pay $255,168 too much, compared to Elk Grove's prices. It should also be noted that the nearby City of Del Mar, which has three cameras, pays RedFlex $1578 per month per camera. This list of contracts and amendments was up-to-date as of Sept. 12, 2017. I have not been able to find a red light camera program info page on either the City's or the sheriff's website.